"The higher unemployment rate among these indicates that India does not produce sufficient decent jobs for its graduates. This is the tragedy of India's employment problem - its higher unemployment for the better educated," the article said. 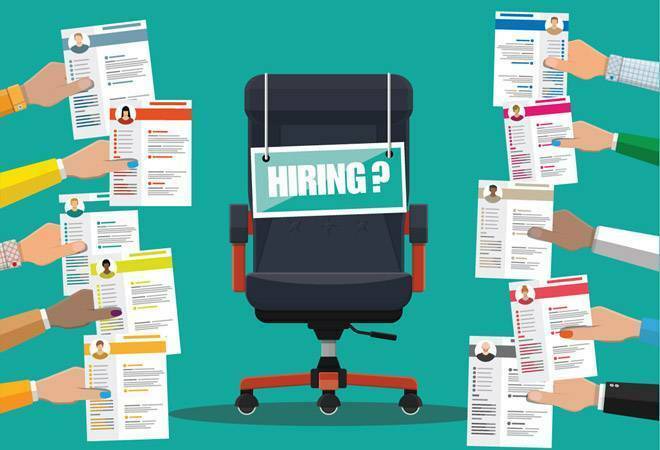 The unemployment rate among those who completed graduation or higher education (graduate+) has been rising steadily since mid-2017, according to a new analysis by the Centre for Monitoring Indian Economy (CMIE). 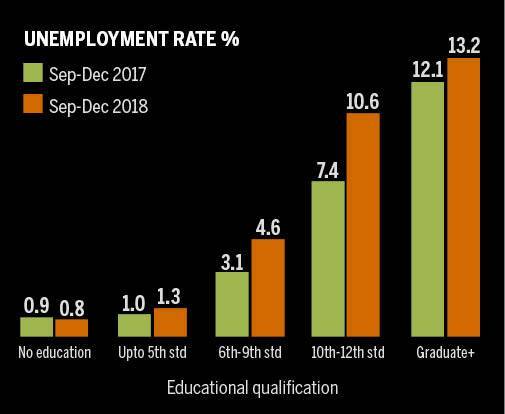 The unemployment rate among higher education section touched 13.2 per cent during September-December 2018, as compared to 12.1 per cent reported in the year ago period, an article written by CMIE MD and CEO Mahesh Vyas said. According to CMIE, graduate+ face the highest unemployment rate among groups of individuals organised by the level of education achieved. It is usually twice the average unemployment rate for the entire labour force. This is even worse in case of graduate+ women. The most discomforting factor emerging from the study is that unemployment level rises proportionately as education level rises among those studied. The study is based on a survey of five groups of individuals on the basis of the maximum level of education - those with no education; those with education upto fifth standard; those with education between sixth and ninth standard; those who cleared tenth, eleventh or twelfth standards; and those who completed graduation or any higher level education than graduation. The average unemployment rate stood at 6.7 per cent during September-December 2018, the data showed. It stated that uneducated did not face much unemployment as the unemployment rate for them was a negligible 0.8 per cent. The rate was low in case of the poorer people as they have to take up any job, no matter how "poorly paid or however risky". The next group, those with education only up to fifth standard also faced a very small unemployment rate of only 1.3 per cent. The compulsions to take up a job for this group could be no different from the earlier one, it said. The unemployment rate jumped to 4.6 per cent for those who had completed between sixth and ninth standard. For those with qualifications between tenth and twelfth standard, the unemployment rate was uncomfortably high at 10.6 per cent. Then, it rose even higher to 13.2 per cent for graduate+. "This rising of the unemployment rate with rising education levels indicates that India is unable to produce sufficient decent quality jobs for the better educated. And, the better educated are not willing to take up just any crappy job," Vyas said. The CMIE report said India has a very low labour participation rate of around 43 per cent. The report also highlighted the labour participation rates in India as per the education level. "Education in general, and college education in particular is good for labour participation. Labour participation rates are below 40 per cent for those with education below tenth standard. It improves to 43 per cent for those with tenth to twelfth standard education. Then, for the graduate+ group it shoots up to 61 per cent," the report said. Labour participation rate of graduate+ has also improved from less than 60 per cent a year ago to 61 per cent. The report also analysed labour participation among women graduates. "College education makes a big difference to women. Overall female labour participation was extremely low at 11.1 per cent during September-December 2018. But the participation was more than twice as high at 22.6 per cent for graduate+ females," the report said. The report said over the past one year, female labour participation rate fell from 12.1 per cent to 11.1 per cent. But, labour participation among graduate+ women increased from 21.6 per cent to 22.6 per cent. It was stable at 9 per cent for females with an education level between tenth and twelfth standard. But, it declined for women with lower levels of education. "Graduate+ women face a punishing 35 per cent unemployment rate. This is a tragedy of discrimination. The unemployment rate for graduate+ men was much lower at 10 per cent. Why should the few well-educated women who seek jobs face a much higher unemployment rate compared to men with similar education levels?" the report said.